NOTE: The winners of this giveaway are Donna B. and Roberta Lottino, both of whom who liked Plume! Congratulations, ladies – send me your snail mails please. I’m sorry I don’t have more precuts to give to all of you, but we’ll have another giveaway later this summer! Hi everyone! I haven’t blogged in SOOOO long! It has been busy here with (in the spirit of Quilt Market) secret sewing stuff, but I’m finally getting around to writing about what I have been working on. Since pictures speak louder than words I’ll try to keep words to a minimum. My new collection for the Contempo division of Benartex is called Feathers & Flourishes and it is shipping in July. It is inspired those shapes that we see so often in the quilt world. This time my goal was to create a collection that allowed people to really experiment with color. So I have added a deep navy and vibrant red, along with the greens and aquas that I love. Consequently, each quilt can look dramatically different depending on the proportions of the prints used. Here you can see a wider view and a little of my friend Cherry Guidry’s booth next to mine as well. I have 4 new patterns that will be released with this collection. They will be on my website as soon as I get them back from the printer, probably in a few weeks. The first is Plume. This is a REALLY simple medallion quilt. The blocks are made from a stack of 10” squares so you just change the borders and background to get an entirely new look! “Plume” – Special thanks to Traci Adams and Joanne Leonard for piecing the color variations hanging on the sides of the red version! The next quilt is called “Starstruck”. This one almost never made it off of my computer screen. It was one of those that really sang in person and even more so once it was quilted so that the secondary diamond pattern came out. It was probably the “hit” of my booth so that shows you how much I know… haha! Oh – and it is made from a couple 2-1/2” pinwheels and two background fabrics. The third quilt is called Posies. You can only see a little of it here because it is folded up due to limited wall space. Posies is a fat-quarter friendly quilt and the flowers are on-point – I’ll show you more once I have the patterns back. I love how different the prints look against the navy background! And my final set of patterns is called “Flourishes”. It is a set of 3 designs that can be finished as a tryptic of min-quilts or a pillows. There is an SVG option on this pattern as well and Hill Creek (now Just Another Button Company) is producing a button pack for both the white and navy versions. 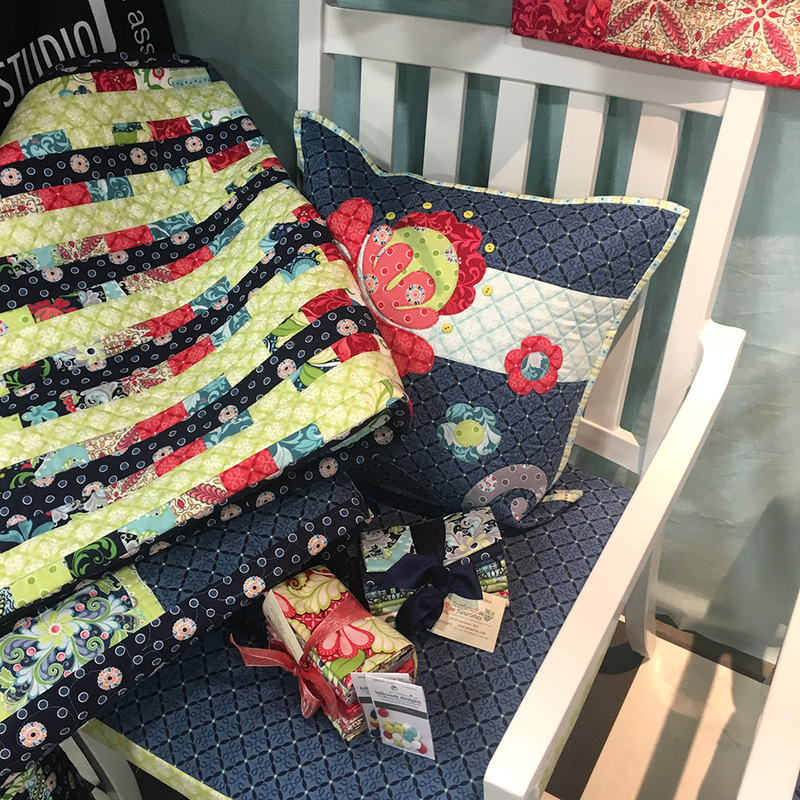 The navy version of “Flourishes”, finished as a pillow and peeking out from behind the precuts and a quilt made from one of the free patterns for this collection. To the left of “Flourishes” you can see the free embroidery pattern for this collection that I designed. The embroidery collection is put out by OESD. In another corner of the booth you can see a peek of my other free pattern for this collection called “Cinema” – more on that soon! I almost forgot! For the first time I’ll be coming out with a quilting collection to coordinate with my fabric collection! So excited as it will be well-timed with the arrival of the Q-Matic system for the BERNINA longarm. 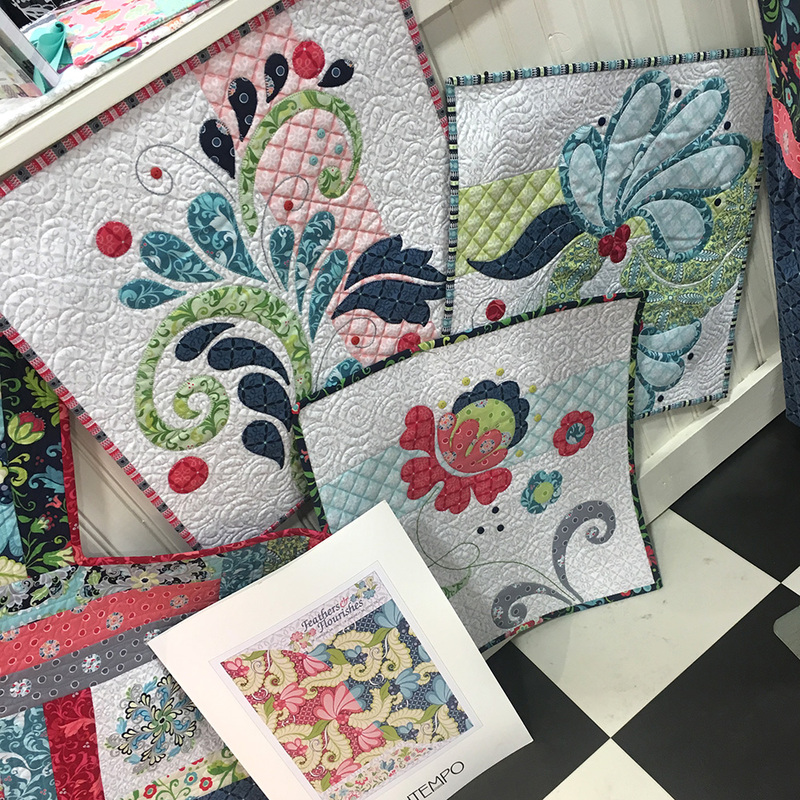 The Feathers and Flourishes Quilting Collection is undergoing testing in June and will be shipping in July. Here is my friend Cherry Guidry’s booth next to mine. Isn’t it pretty? If you love this collection I’d love for you to ask your shop to order it – thanks! SO if you have actually lasted through all of these pictures (hi Mom!) it is TIME FOR A GIVEAWAY! Did you see those precuts sitting on the chairs at Market? I snagged a couple for you guys. I have a stack of 10” squares and a bundle of 9 fat quarters to give away so leave a comment below telling me which new pattern you like best – Plume, Starstruck, Posies, or Flourishes? Please only enter once and leave me some way to reach you if I can’t see it through your profile. The last day to enter is Tuesday, May 31st. Thanks for letting me share and have a wonderful Memorial Day! Previous post: Easter Egg Table Topper Complimentary Pattern! Next post: Feathers & Flourishes patterns are in – plus a giveaway! I love star struck the most, but all of them are wonderful and I can see adding all of them to my to do list! Plume. I love the combination of appliqué and piecing. I also think that your fabric compliments the appliqué well. Flourish is so pretty! I can’t wait to see you in Ohio in June. I have to say starstruck, because of the pattern, but mostly because of the amazing quilting you did which makes it sing!! Love them all but especially Posies! I can see endless variations of Plume! I really like “Posies”. I also like the cute little girl’s dress. Is that one of your patterns, too? Flourish is my fave. Love the colors and designs. Yummy. Thank you for the glimpse of Market. 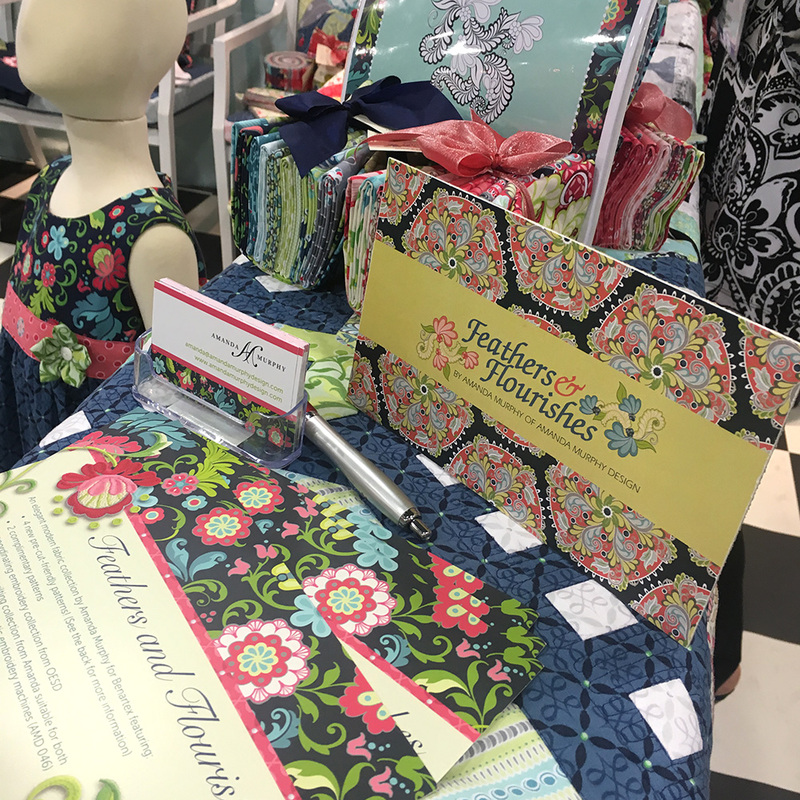 Can’t wait to see your patterns and designs in the store! My vote is for Starstruck. Looks like it might be tricky to piece, but it’s so beautiful, I’d certainly put in the work. Thanks for sharing your booth with us. I like posies. I like colors against dark backgrounds. Hard to decide but I think Flourishes is my favorite. Love star struck! But they are all lovely! Well done! I love all of them. But, I think Starstruck is my favorite. I love the rich colors. It is difficult to choose one, but Flourishes caught my eye. Those are some of my favorite colors. Starstruck is amazing, thanks for the giveaway. All of these designs and fabrics are beautuful but I’d love to make Plume it’s simply stunning 🙂 thanks for the post and photos. Starstruck is my favorite. I’d love it even more if someone would make a Starstruck quilt for me! I absolutely love Flourishes – it has some great elements and I have asked my local quilt shop to ensure it is ordered. I love the shapes and colours. I love them ALL, Amanda! But I’m better at piecing than appliqué, so Starstruck is my fav. Thanks for the chance to win your lovely new fabrics! 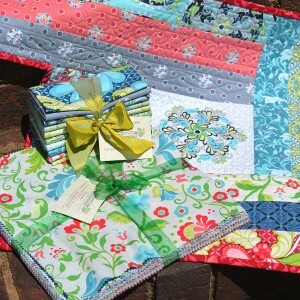 I love the new fabrics and the mini quilts “flourishes” are awesome. Can’t wait to get ahold of your new fabrics. I have loves all your lines. It’s going to have to be ‘Starstruck’…the subtle background with the vibrant stars make it a winner for me. I love the traditional style with the modern palette. It’s a winner. Your designs are breath taking and I love them all but I really think the first one I would want is Starstruck. I so hope I win! Flourishes is my favorite. Love the new fabric line! I love them all, but I guess posies is my favorite. Love, love them all, but the best for me is Flourishes. I love Starstruck! But, I always love all your work and sense of color! I love Flourishes! Thank you for offering a giveaway. I just love all of your designs. My favorite is Posies. They are all gorgeous! Plume is gorgeous! Your booth looks fantastic! Love the new patterns! Everything looks great! This post was worth the wait. So many great patterns and beautiful fabrics. Congratulations. My favourite is Florishes. I like the quilting pattern for this as well. Thanks for the chance to win. I would probably make “Plume” first but then “Starstruck” would be on my list. I can also see adding a large design from “Flourishes” on something. I look forward to seeing more of the “Posies” quilt. Thanks for sharing. It’s a hard decision between Plume and Starstruck, but I guess I’ll have to go with Starstruck. 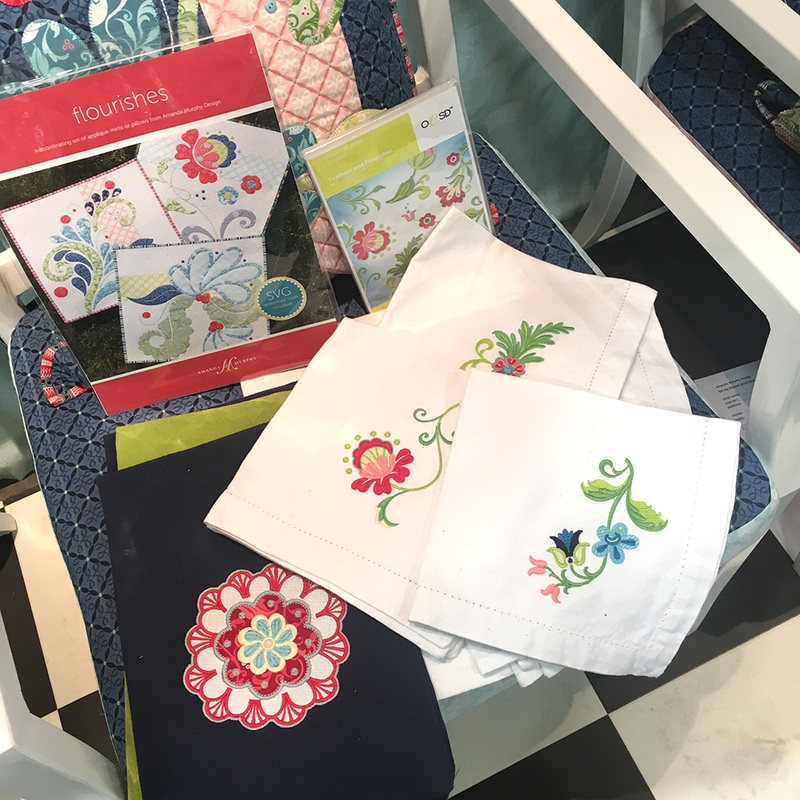 Beautiful new fabrics and patterns! All are gorgeous, and Flourishes is on top of my favourites list!! Thanks for sharing Market eye candy…. It must have been amazing in person!! It is a toss up between Posies and Flourishes. Love the eye candy. I would have to say flourishes would be my favorite but they are all beautiful! I love all of your new designs; but If I had to pick just one I would pick posies! Flourishes is the design I have been looking for but did not know it until I saw this. Can,t wait to get started, already dreaming of colors. Thank you. After much going back and forth, my favorite is Plume! 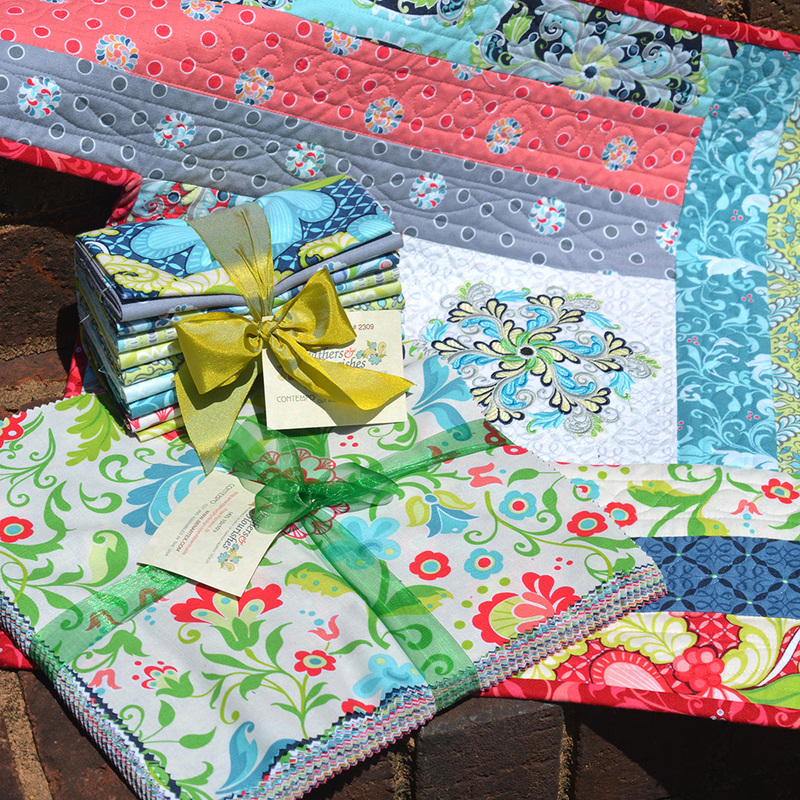 I love all of your patterns and your new fabric line is gorgeous…my favorite color combos. I love Flourishes and I love the Starstruck design. It’s difficult to have a favorite-they are all so pretty! Flourishes would be at the top of my list…. and followed closely by the adorable little navy dress! I love both Starstruck and Flourishes. But if I have to pick only one, I choose Flourishes. I love the layered look, and the challenge in doing it. They are all so pretty Amanda, but I am going for Plume this time. Thanks for the opportunity to win one of your giveaways. I truly love them all and love this collection…but if have to pick Posies! Hi Amanda, your new fabrics are absolutely stunning! I really love the deep navy fabrics and how they all work so beautifully together. I will definitely ask my LQS to get your fabrics as I know they went to Market and they use your embroidery designs. It’s hard to pick a favorite pattern as they are all gorgeous but I’ll pick Posies. Thanks for the pretty pictures of your booth! Hmm…Plume or Flourishes? Both are beautiful. I can just imagine using these together in a quilt. Thanks for creating such exciting designs! I’m inspired. I LUV Starstruck, but also LUV Flourishes on those beautiful pillows. Would like to try both! Flourishes. I would love to do Tula Pink’s butterfly quilt in this fabric. Hmm… It’s hard to decide. I think they are each lovely. I’d say Plume because of what you mentioned. You can change the borders and get a new look-allows you to make the quilt a second time (or more) with ease! ? While its your flourishes I love (as well as the blues & greens that drew me to your style), I’d have to go with “Posies.” Like you, I love the navy background. It makes the flowers pop! They are all great, but Plume, Posies and Flourishes are super great. The addition of the Navy makes everything POP. Great Job, can’t wait to see it in the stores. Beautiful booth and ideas. I definitely want that Posies pattern and love the florishes fabric. Amanda’s fabrics are always beautiful — but I think she’s outdone herself. I see lots of new fabric in my future! Feathers and Flourishes — even a great name for the collection. Posies is spectacular. Your booth is stunning showing off all your wonderful new creations!! ” I am seeing STARS!” Loved – Starstruck! I think Starstruck is my fave! I love Posies, but it is a VERY difficult choice as they are all lovely. Best wishes for your continued success! My favorite is Feathers and Fluorishes! But all of your things are beautiful! 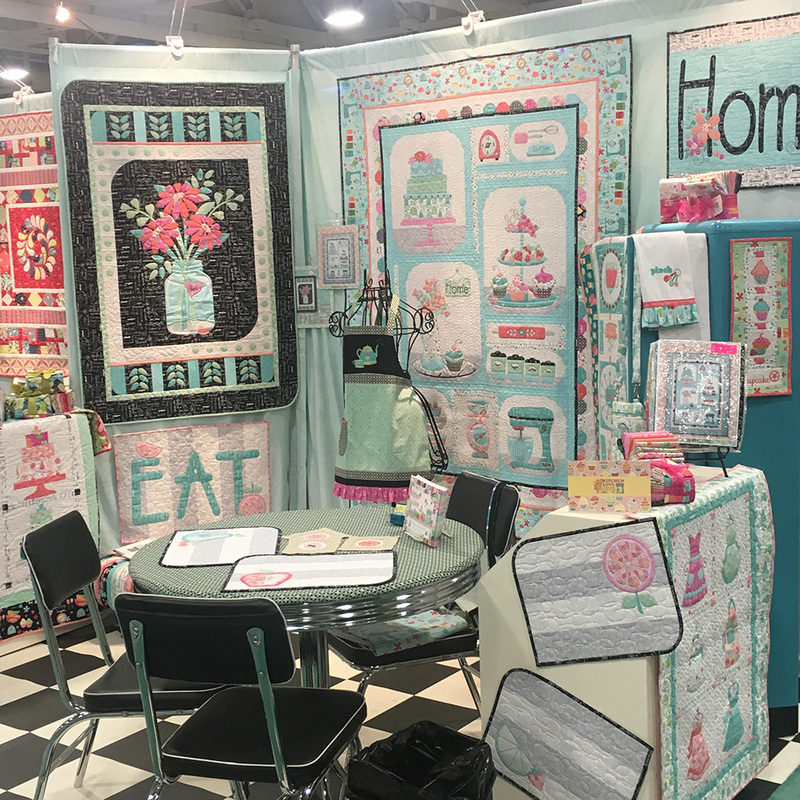 How much fun you must have had a quilt market with all that fabric to fondle. I think I would have been in overload at the end of each day. I love all the fabrics you chose. I especially like feathers and flourishes. Thanks for allowing us the chance to win some fabric to play with! Well, they are all beautiful! How to choose? Think I will go with Posies. Love all of them but Starstruck is my favorite. Flourishes is beautiful but Starstruck is my favorite. Thanks for the chance to win this beautiful fabric. I love the blues. 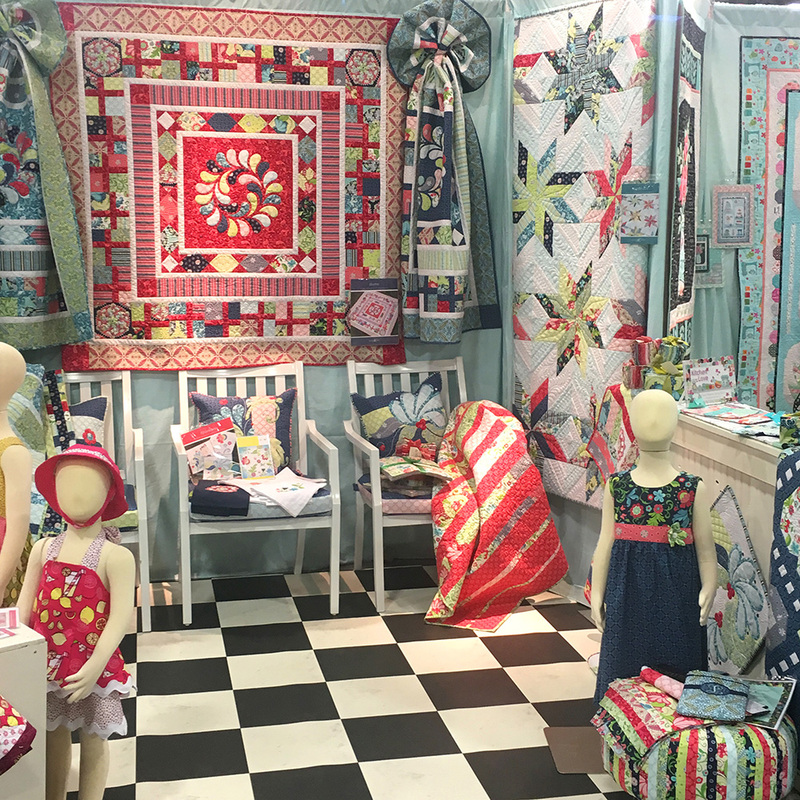 Your booth, fabrics, patterns and embroidery design are ALL gorgeous!! That embroidery design will really set off the Flourishes quilt! I LOVE all those new patterns and for each one their own reason! I just don’t know if I can choose just one!! I think I and going to order the embroidery designs just because they are so beautiful!! If I have to choose, I imagine Posies would fit the bill for me! I love to piece quilts!! Okay. How do you choose just one? I love them all. But if I had to choose one I’d pick Posies just because it’s spring. Love flourishes and love the colors! I have to say I was immediately drawn to starstruck! I love your fabric designs they are always elegant and feminine, but I love the new addition of the deep blue and red in this collection! Congratulations!!! I love Flourishes and thank you for sharing your booth, gorgeous eye candy. I LOVE the Posies!!!! Beautiful!!!! Amanda everything is so pretty! I think I would have to say that the Flourishes is my favorite. You have such a unique style, so beautiful! It’s a tough decision, but I’d have to go with Plume. Curvy things appeal to me. I love Starstruck! Thank you for the chance to win this beautiful fabric. Love plume and the use of red in your fabric line. I love them all but starstruck is my favorite. The colors are so intense and I love the spark they give each quilt when placed together. I would like to know if there is a pattern for the sweet little girl’s dress show beside the tuffet. I love the Starstruck. Beautiful pattern and fabrics. Tough choice…but Starstruck won in the end! Love them all! Having to choose is terrible!!! I guess Flourishes wins for now but I see the others coming to my quilt room as soon as they’re available. Thanks so much for sharing this with us and have a wonderful Memorial Day. Starstruck is my favorite. Thanks for sharing all the pictures. Love the Flourishs but love them all. Hope to win the fat quarters. Thanks for the free patterns. Flourishes is my favorites but all are terrific! Great designs! Starstruck! is my favorite! I love your designs. 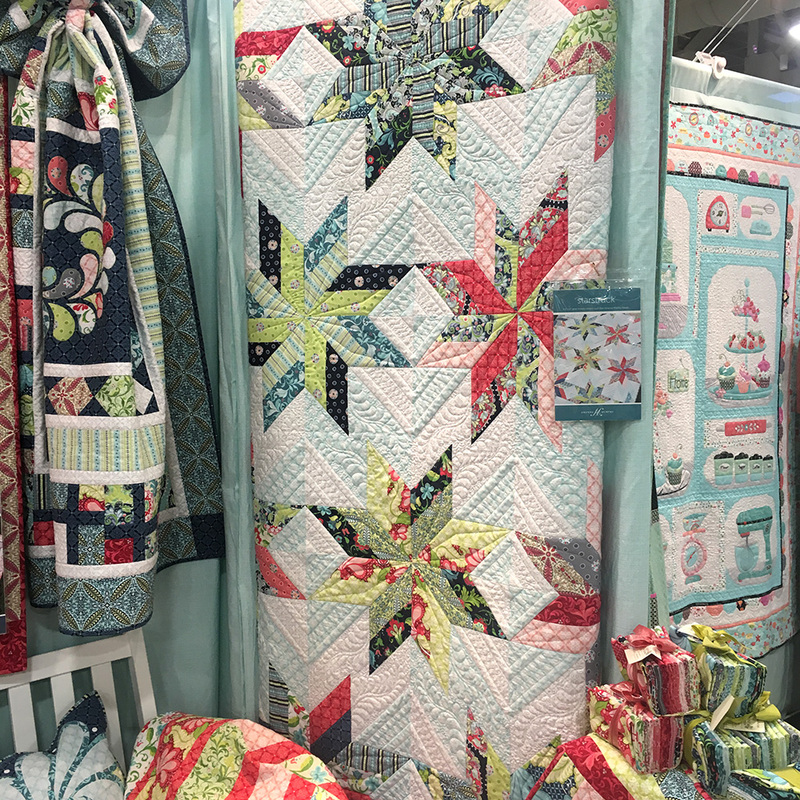 Love them all, and I really love how you combine your embroidery and quilting designs in your quilts, so I’ll pick “Starstruck” as my favorite. “Flourishes” is a very close 2nd, lol! (Have thoroughly enjoyed your Craftsy class and learned so much!) Thanks! I like the Flourishes though they are all beautiful. I think some fabric painting might be inspired by some of your designs. Posies & all the rest!! YUM!!!! Love the flourishes, but they’re all pretty! I love the movement of Flourishes… reminding me of feathers, flowers and the sea! My favorite pattern is Posies. All of the patterns are great and your fabric line is beautiful. 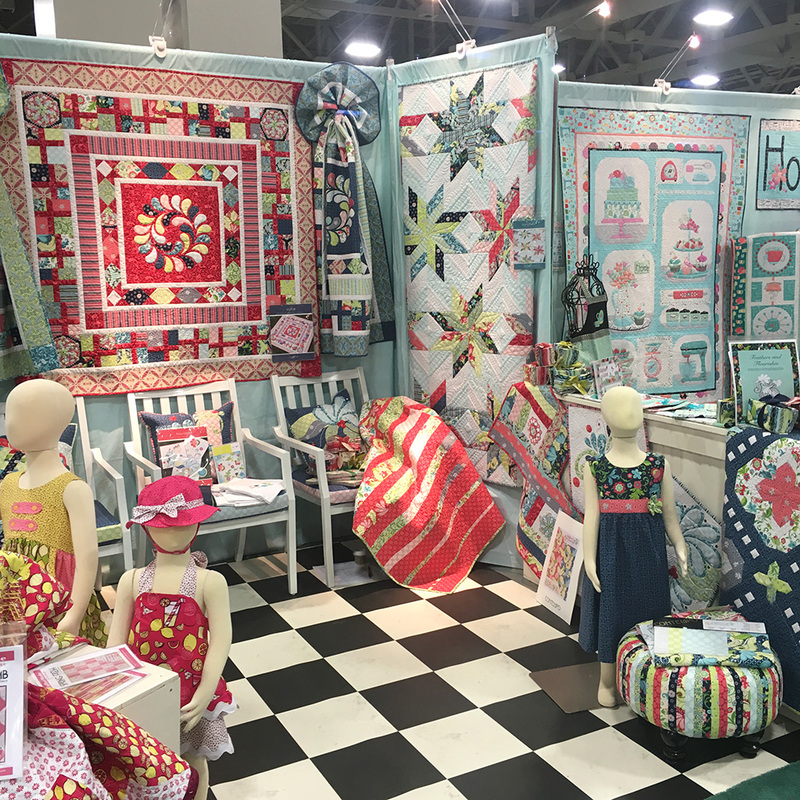 Your booth at Spring Quilt Market looked amazing. Love all the patterns, but if I have to choose, Posies is so cute. This is a hard choice. However, I think my favorite is Starstruck, because it reminds me of a string quilt my mother made when I was a child. Love the Flourishes. I’d already seen the amazing collection of them on the OESD website. Thank you for sharing all your wonderful new patterns. I love Flourishes and will look for the embroidery as well. Thanks for the giveaway. I love all the patterns but I think I like “Plume” best. And I really love “Cinema”, too. I love them all but Plume and Flourish stand out! I can’t wait to try the machine embroidery. Hi “Flourish” is my favorite. 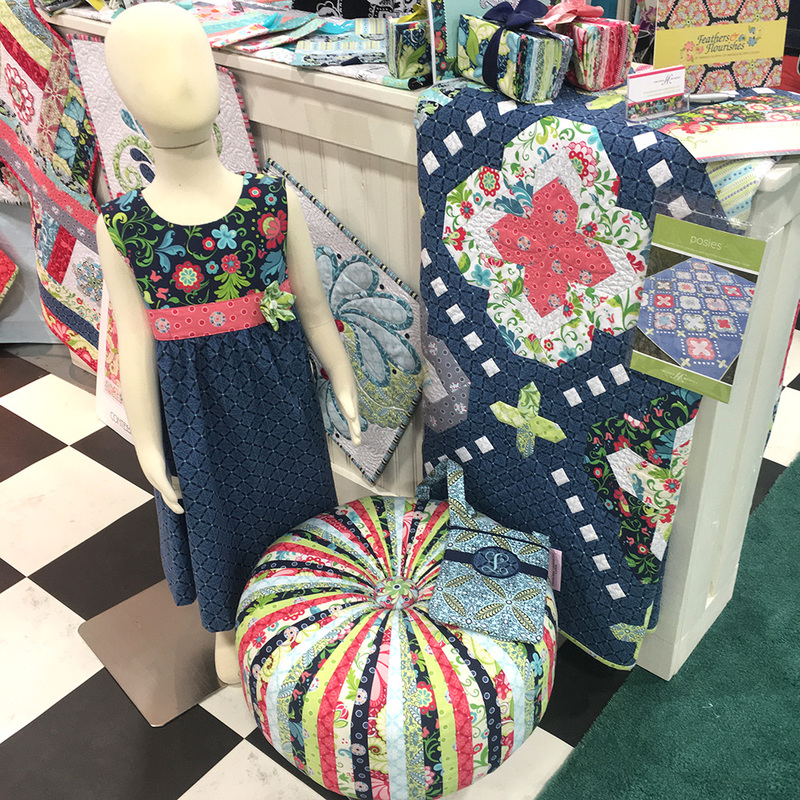 Love the new fabric line!Thanks for sharing! 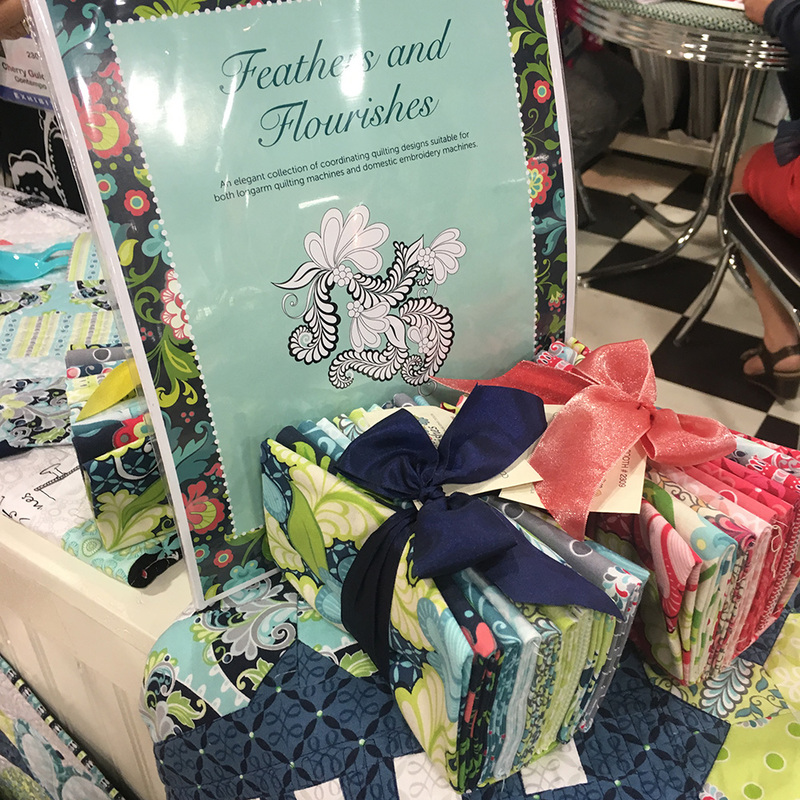 The feather and flourish line is gorgeous! Your booth looked lovely too and plenty of inspiration for all of us. Thank you for sharing your great photos. 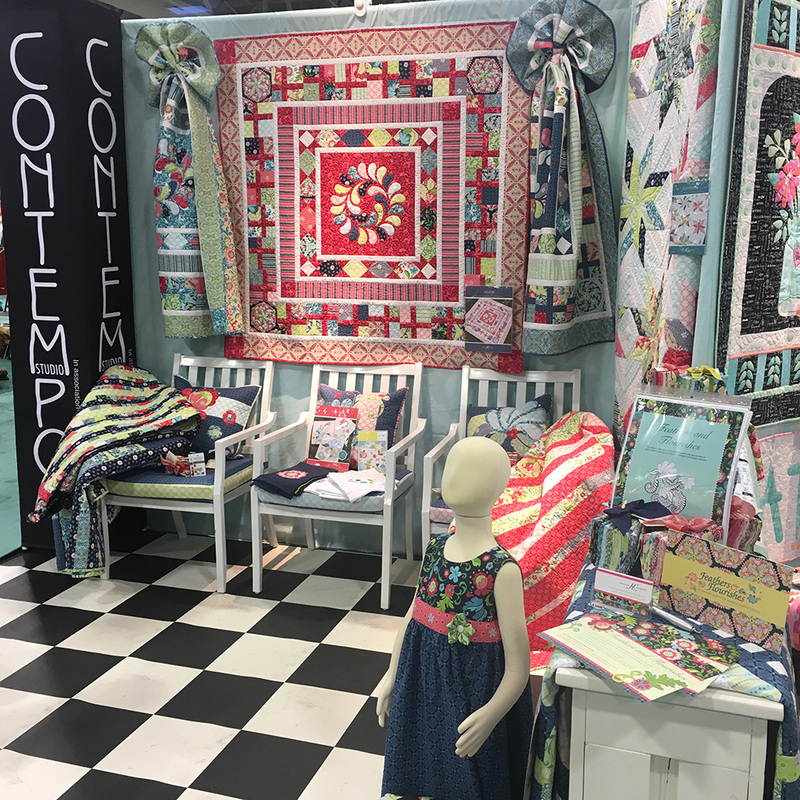 How wonderful that you have made a connection with Sharyn Cole with Tuffet Source. She is a wonderful person and so creative, like you, dear one! My favorite in this collection is Flourishes in the white version with navy. It is absolutely stunning! So glad you are continuing to thrive. God bless. It was a hard choice between Plume and Flourishes, but I think Plume is my favorite. I can see it done in a lot of different colorways. I love Posies and Plume the best. Starstruck is my favorite. I LOVE star quilt patterns and this one is just gorgeous! Thanks for adding the deep navy to your collection, too. It is such a hard color to find! Like so many others I like flourishes. The whole collection is very inspiring. Love Love LOOOOVE “Posies”!!! It is soooooo Beautiful…even tho don’t see whole quilt! the Colors are Awesome!!! I like them all but Starstruck might be my favorite. Plume is a delight. I like them all, but I will choose Plume. I absolutely love the Feathers and Flourishes line. Hard to choose, but Plume it is. I love all your new patterns. So beautiful. I think I like Plume the best. 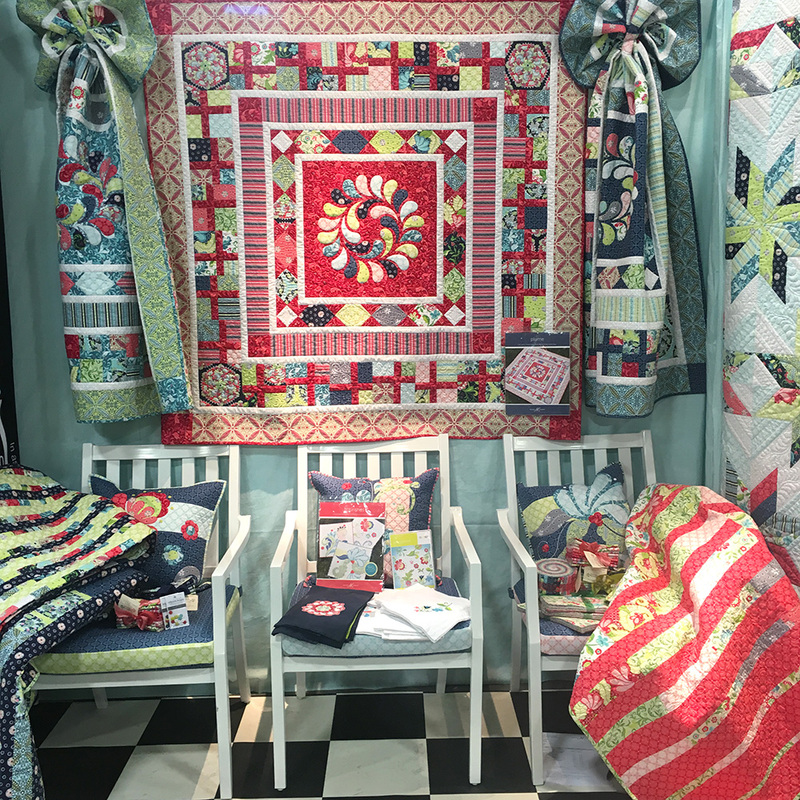 Thanks for sharing about Quilt Market. Plume is my favorite. Your colors make it come alive! I am just finishing up your Flower Power Quilt with my favorite Quilting shop and started following you on Craftsy! 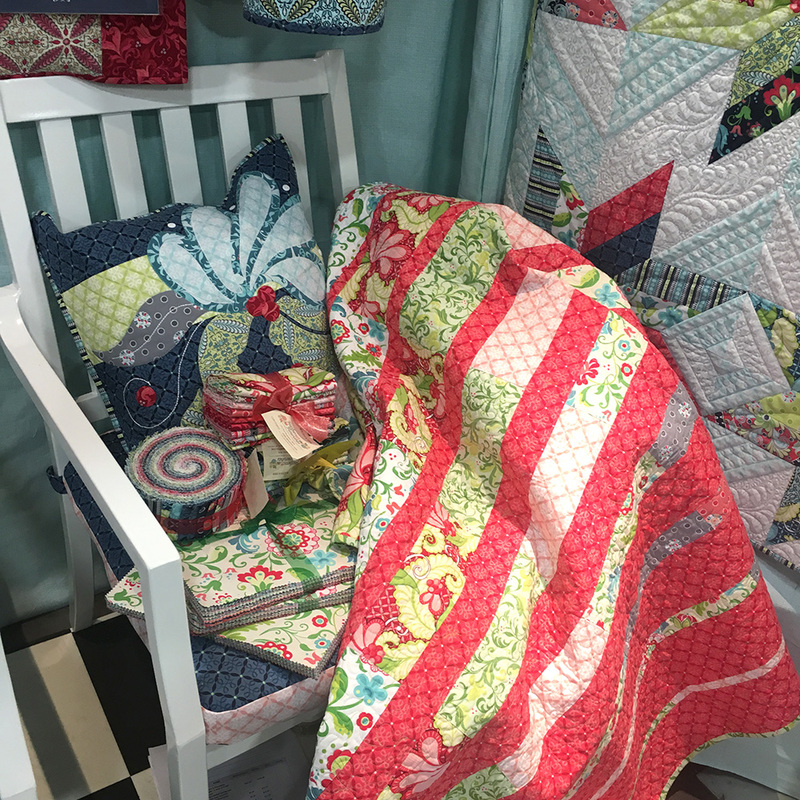 Thanks for sharing Info from Quilt Market ! Love all the new designs and fabrics, but would say Plume is my favorite. I am a new quilter (since Jan this year) and loving my new passion. I am currently working on my third quilt. I am making the Blossom quilt in a combination of yellows with a splash of soft red and some lime green and I am loving the challenge. Hi Amanda, Your pictures were all simply beautiful, and I love them all. I have to pick Flourishes as my favorite, but I have to say, it’s a difficult choice. 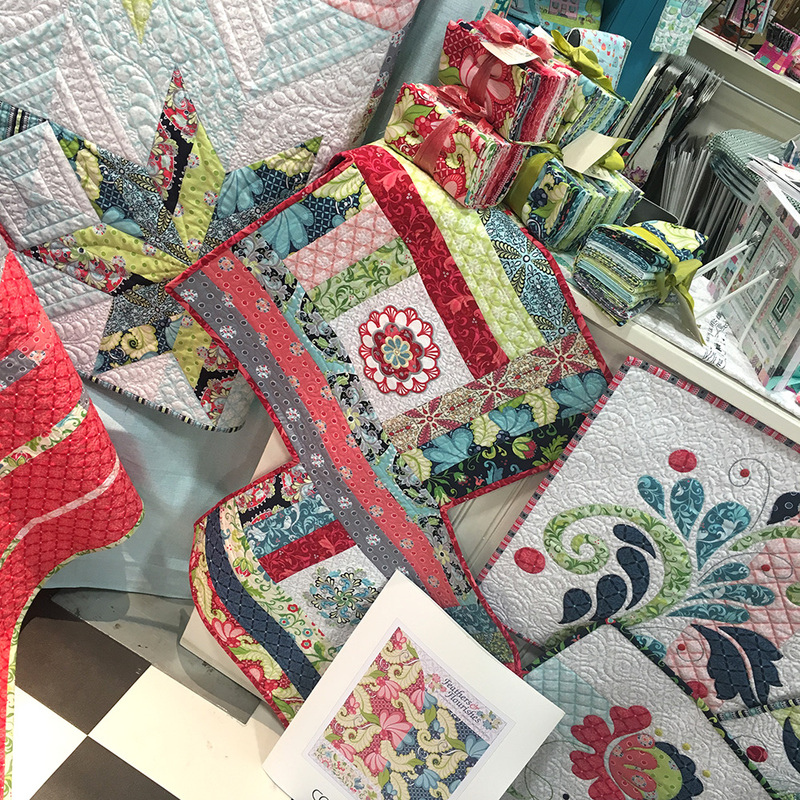 Has to be Plume – I LOVE medallion quilts! LOVE LOVE LOVE them all!!! Wow what a display. It’s hard to pick only one but I would have to say Plume – the medallion quilt is spectacular. I absolutely love both Flourishes and Starstruck! Can hardly wait to get them both! They are all wonderful but I Posies is my favorite. Thanks for all of the pictures. All are so beautiful!! Posies is my favorite right now!! ?? It was hard to pick just one, but Plume would be my first choice. Love them all Amanda! They’re so beautiful but Posies is my favourite. Its too hard to decide which one is my fav, but if I had to only pick one it would be Posies. Love your fabric collections. I can’t wait to get my hands on Feathers & Flourishes! Oh gosh. If I’m forced to choose one it would be Starstruck. But I like them all, even the free pattern you mentioned! Starstruck is my favorite. Glad you decided to make it. Thanks for the giveaway! Beautiful fabric as always! My favorite was Starstruck. Thanks! Thanks for telling me on facebook how to enter for your fun gift. I must have done it wrong the first time. It was really hard to pick one, but if I need too, I pick Starstruck. Congrats on all your projects. Plume and Flourishes are beautiful, but I don’t really like to applique that much, so I pick Posies. LOVE the navy blue in the quilts!! I really like Posies. They are all pretty.